Bandhani work in India is believed to have originated in Sindh, and subsequently spread to Rajasthan, Gujarat. The term bandhani is derived from the Sanskrit word banda (“to tie”)/ or `bandhan` that means tying up. The art of Bandhani is a highly skilled process. The technique involves dyeing a fabric which is tied tightly with a thread at several points, thus producing a variety of patterns. After the processing is over, results into a variety of symbols including, dots, squares, waves and strips. Bandhani is also known as Bandhej or Tie Dye or Bandhni, etc. as per the regional pronunciation. In the early days dyes were extracted from roots, flowers, leaves, and berries. Nowadays artificial colours are also used. It is an ancient art practice; some 5000 years ago, that finds its mentions in the Alexander the great time texts about the beautiful printed cottons of India. As per evidences in Historical Texts, the first Bandhani saree was worn at the time of Bana Bhatt`s Harshacharita in a royal marriage. 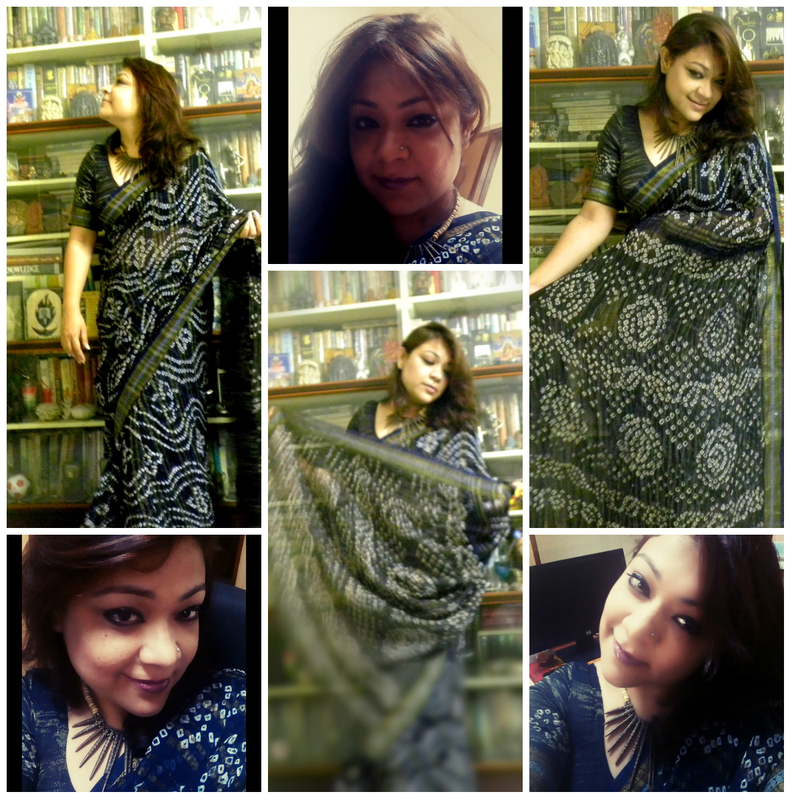 Cut to 2015 & #100sareepact! Since childhood I was fascinated with the abstract patterns and dots and colours of Bandhni. 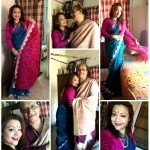 Though I had few salwar pieces, dress but this has been the only Bandhni saree I possess till date. The sheer uncommon combination of navy blue (again #shades of blue) and golden zaree had attracted my attention! I wore this georgette Bandhni recently in office with an abstract neck-piece of gold & crème.